Your adventure starts in Chicago or Seattle when you board Amtrak's Empire Builder headed for Glacier. Read a book, talk with fellow travelers or enjoy a drink in the bar car as you speed towards your vacation destination. During your Glacier Park stay be sure to take advantage of all the sights and activities available. Exploring the wilderness that makes Glacier so famous is a must. This spectacular getaway also offers travelers the opportunity for a round of golf or a swim in your hotel's heated pool. The return home will also be enjoyed on Amtrak's Empire Builder, where you can sit back and recall fond memories of your Glacier National Park vacation. This vacation can be booked online for departures from the following Amtrak stations: Chicago, St. Louis, Detroit, Milwaukee, and St. Paul/Minneapolis. For other departure cities, please select the Chicago location, and a rail specialist will contact you within 48 hours with a package customized with a departure from your most convenient Amtrak station. This itinerary is also available from Seattle to Chicago, based on your travel preference. Day 1 - Depart Chicago aboard the Empire Builder. 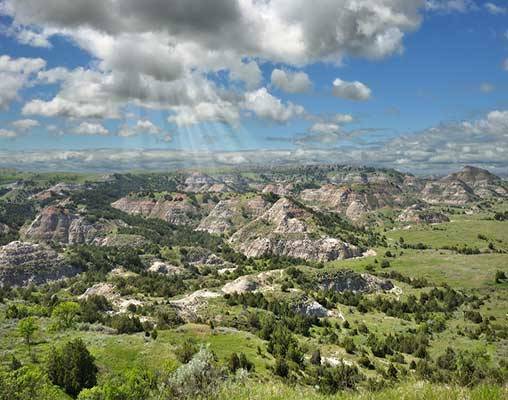 Board the Empire Builder and head west on the journey that takes you through impressive, eye-popping scenery of the majestic North and Pacific Northwest of the United States. Relax as the train makes its way through the Wisconsin Dells and St. Paul-Minneapolis, Minnesota tonight. Overnight train. Day 2 - East Glacier Park, Montana. When you awake this morning, the train is traveling through the grasslands of the "Northern Prairie State" of North Dakota. This evening the Empire Builder arrives at the stunningly beautiful ice-carved terrain of serrated ridges, jutting peaks, dramatic hanging valleys, 50 glaciers, more than 200 lakes, waterfalls and thick forests that cover 1.2-million acres of protected land. Overnight at the Glacier Park Lodge with a heated outdoor swimming pool, nine-hole golf course, and close proximity to Glacier National Park, Glacier Park Lodge is a wonderful Montana destination resort. Overnight Glacier Park Lodge. 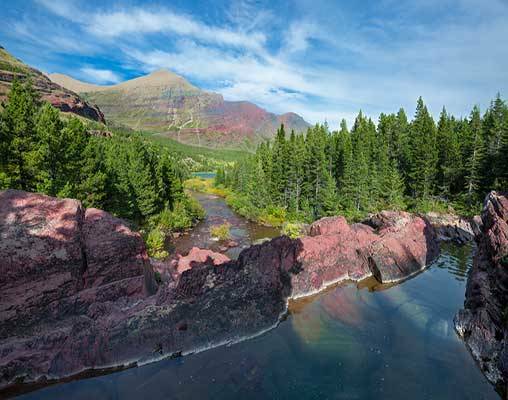 The most inclusive tour of Glacier National Park starts with a morning drive over Marias Pass, with wildlife viewing at Goat Lick and a stop at the historic Izaak Walton Inn. Tour the grand cedar & hemlock forests on your way to an optional lunch at Lake McDonald Lodge. After lunch, ascend to the high alpine of Going-to-the-Sun Road at Logan Pass and down the St. Mary Valley. Overnight Glacier Park Lodge. Board Amtrak's Empire Builder train bound for Seattle this evening. Relax as you watch the Cascade Mountains come into view. 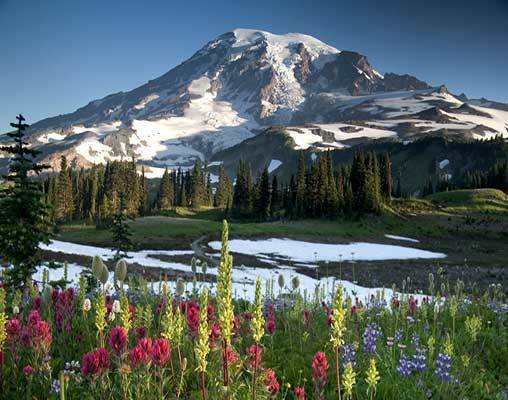 Snow-capped volcanoes and forested mountains dot the landscape as you reach your destination. Overnight train. The Empire Builder arrives in Seattle at 10:20 am where your Northwest rail vacation comes to an end. Hotel nights at Glacier Park Lodge. Amtrak accommodations are available in Coach class, Roomette and Bedroom. Coach accommodations include a reclining seat with leg rest. Roomette accommodations include a private cabin that features two comfortable seats beside a picture window during the day, which converts to an upper and lower berth at night. Bedroom accommodations feature a sofa and chair by day and upper and lower berth by night. Bedroom accommodations also include a sink and self-enclosed toilet and shower. Click here to view testimonials for Glacier National Park Escape-Chicago to Seattle. We had a wonderful vacation. The Amtrak service was superb and trouble free. Everything went according to schedule and having the train, Glacier Park lodge and 'Red Bus' tour all in a package was perfect for our 30th Anniversary Adventure. Enter your details below if you would like to be notified when 2021 dates and prices are available for Glacier National Park Escape-Chicago to Seattle. Prices are are correct at the time of this web page being published; yet, are subject to confirmation at time of booking. Prices are land-only, per person based on double occupancy. Vacations By Rail can supply connecting rail from your closest Amtrak Station.